I have a PR implementing denoising discrete Lanczos derivatives, following this paper. The following code works well, but the design is a train wreck, and I was hoping to get some advice to improve it. 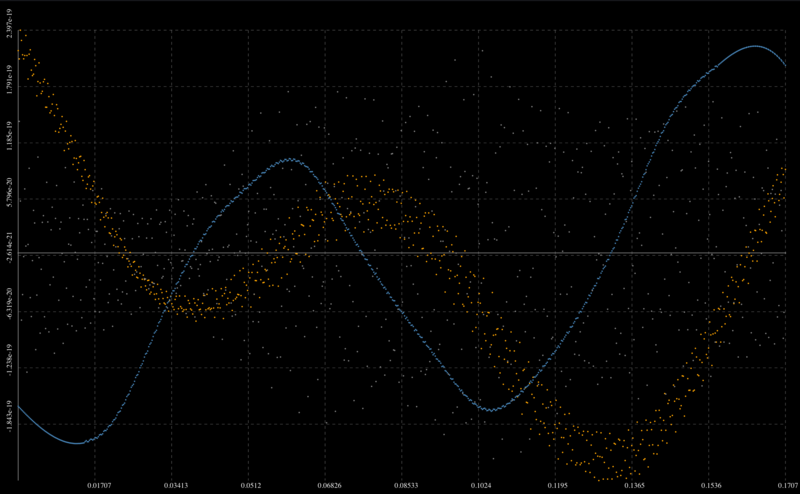 The orange time series shows the raw LIGO signal. The blue is the derivative of the LIGO signal computed with the (n,p) = (60, 4) discrete Lanczos derivative, and the gray is the standard finite difference formula, which is total garbage. I will only post the code, but here are the tests and documentation. // but that'd make the indexing awkward when applying the filter. // so it seems like an obvious optimization target. // but still a small fraction of the total compute time. // Hence I'm not refactoring out these norm calculations. That's a pretty dramatic demonstration image - there's no doubt that the function is worth having! I make no claim to understand the mathematics, but I'll happily look over the C++ code. We have a portability problem, as we've consistently omitted the namespace of std::size_t and std::int64_t (BTW, consider std::int_fast64_t as a better alternative to the latter, unless we need exactly 64 bits). Now, let's move on to class discrete_legendre. It's usually a bad idea to have a class that is constructed into an unusable state, requiring a second "initialization" phase before it's valid. Sometimes it's unavoidable, but that's not the case here. Simply pass the initialization parameters to the constructor, and omit the initialize_recursion() member (simply create a new instance, as that's no more work than resetting all the members). Minor issues: norm_sq() can be declared const. The filter functions are next. Please don't use l as a variable name; it looks too much like the digit 1! For indexing vectors, a good practice would be to use std::vector<>::size_type rather than assuming that it's std::size_t. But don't get hung up on that. We could consider a Strategy pattern here, but I suspect that would lead to bigger and less clear code. Leaving the detail namespace, we reach the main class, discrete_lanczos_derivative. Why !std::is_integral_v rather than the more obvious std::is_floating_point_v? Are we expecting this to work for std::complex<> values, perhaps? Given that almost every method switches on order, I think that specializations or separate classes for first-order and second-order are likely to be clearer. We could put the common parts in a base class. v is user-supplied, so an assert is the wrong kind of check here if it terminates the program. I think it's better to throw a std::out_of_range or similar instead. Perhaps a signalling NaN would be more appropriate here? Although, as I understand it, this seems to be reached only if we're instantiated for an out-of-range order. There's not necessarily a performance penalty for this - the compiler may choose to inline it, or (better) arrange the functions so that one is a prefix of the other. Not the answer you're looking for? Browse other questions tagged c++ c++17 numerical-methods signal-processing or ask your own question.